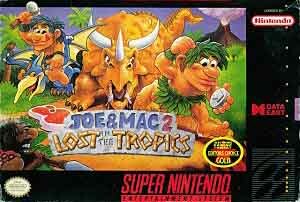 Joe & Mac 2: Lost in the Tropics for Super Nintendo is the second title in the series. 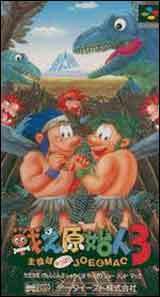 Play as Joe and Mac. This time, a caveman named Gork has stolen the crown belonging to the Chief of Kali Village, and it's up to you to retrieve it by using the 7 Rainbow Stones you will collect on your journey. Fight dinosaurs, cavemen, and other prehistoric enemies as your travel through the jungle, or through the ice and snow, or even through a volcanic wasteland.